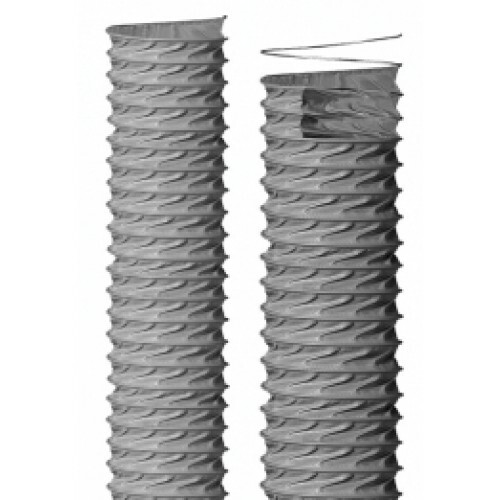 Technical Features: Flexible ducting made in PVC coated fibre glass fabric, reinforced with a steel wire. The steel helix is welded between 2 fabric layers. Properties: Flame resistant according to UL94V0 and M1 grade according to NFP 92 503. It comes in compressible length (about 8:1) for easy handling and cost saving in stocking and transporting. Resistant to high temperature up to 100°C (peaks 130°C for short terms). High mechanical characteristics: very good bending radius, light, flexible, easy to handle. Air conditioning plants, ventilation systems, suction of welding fumes, gas, vapours, dust and spark resistant.